The SAP Systems are organic structures, evolving with new technologies and functionalities all the time. To fully benefit from it’s implementation in Your company, it is vital to always keep tracking all the curent development, and optimizing your work habits to it. Our innovations bring huge ease to that. Thrive on SAP, thrive with us. For the last 17 years of being a SAP Partner, we help our customers deal with their everyday problems, and innovate the SAP systems they use. We are not afraid to come up with intriguing solutions that can often elegantly solve very complex problems. Thus, we’ve worked for more than 120,000 project days. Scope of our competencies include all standard business processes supported by SAP. Our sector is focused mainly on industrial and utility companies. 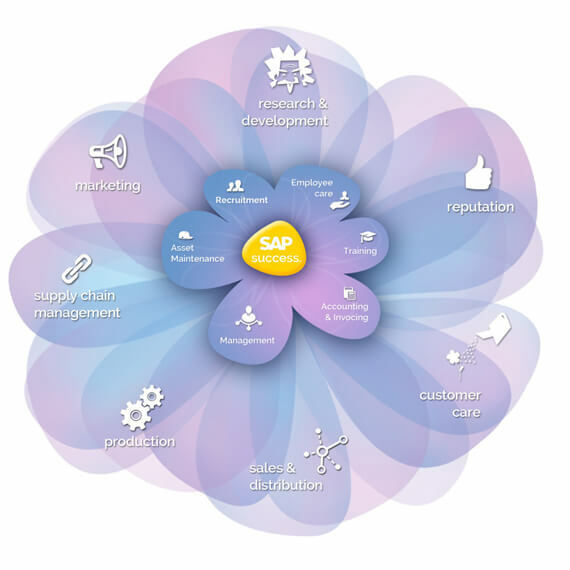 We supply our customers’ with implementations of the entire system, any of the modules, roll-outs, and design solutions for specific customer-requirements.One of our core skills is the ability to deliver our customers developmental solutions using the latest functional and technical innovations of SAP. Also, evidenced by regular SAP Quality Awards acknowledgements in the Innovation area. SAP information system, to be as functional and prosperous as your company, needs an adequate attention and care, organic development and final touching. Our architects and senior consultants usually have 10+ years of international SAP experience, along with deep knowledge of both classic and innovative SAP technologies and systems. They are therefore able to propose some of the today’s market best solutions of the customer’s requirements. We guarantee the highest possible utilization of SAP standard in both technical and functional part of a delivered solution. For regional or industry-specific requirements, that standard functionalities of SAP systems may not cover, we develop our own products with the quality and guarantees that comply standards of any SAP product. Quality is not just an empty word for us – besides certifications and methodologies, we have developed practical tools of everyday use like ABAPdoc, motivating developers to perform in a high-quality and transparent development. Another handy tool is BPMN converter, allowing the BPMN tool to analyze existing, and often already confusing SAP Business Workflows, ccBPM processes and integration scenarios.